A masterwork demonstrating both decorativeness and realism painted towards the end of the artist’s life. Active at Nippon Nanga-in from the mid-1920s, it was around 1930 that a change in style emerged in Kangan’s works. Making a complete change from the characteristically profound landscapes he had been painting until then, he began to present more bird and flower paintings and works featuring a realistic tendency and decorative elements. 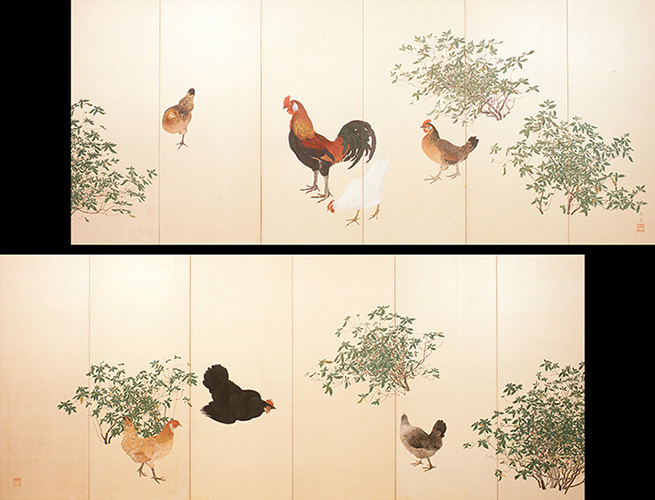 This pair of six-fold screens was submitted to the Nippon Nanga-in Exhibition held in 1934 together with a sketchbook entitled A New Account of Tales of the World. While possessing both realism and decorativeness, this large image portraying azaleas and games fowls proved popular as it also maintained an elegance typical of nanga (literati painting). However, this was the last time Kangan presented his works at the Nippon Nanga-in Exhibition. Having spent the following year, 1935, ill in hospital and convalescence, in 1936, he died at the young age of forty-six. That was just the year in which Nippon Nanga-in was dissolved.